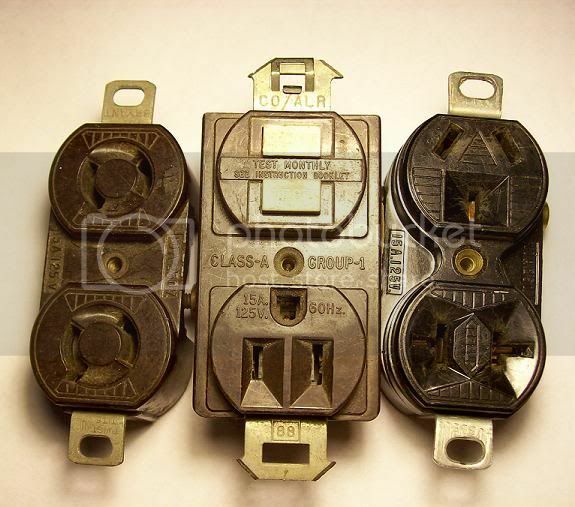 and Hubbell, 10A 250V or 15A 125V. In case you can't see it, the bottom plug on the Hubbell is an ungrounded T slot. Does anyone know how old the other two are or come across them? I remember Square D had a GFCI like that Bell in the 1970s. Last edited by Trumpy; 12/17/10 08:11 PM. The single outlet part on top I dug up in my yard. The Leviton box goes with the outlet next to it. The center receptacle is by National Tool & Mfg. Co. (NTM). The right one is a GE from Mexico that had been in my living room (replaced as it was wrong color). The rest of the outlets in my house are Levitons 15A in ivory, the type that only have the push in connections (no terminals). Anyone heard of NTM Co? Just a FYI: Sq D used to own Bell prior to Bell being sold to Hubbell, their current owners. I've picked up quite a few NT&M outlets during rewires. They seem to be from the 40's & 50's. They also seem to be built very similar to the Leviton that you have in the same photo.. The brown GE used to be popular at the local grocery stores & Kmart if iirc. The fragment single outlet is a prehistoric Hubbell from what I can tell. Thanks for the info on the GFCI. I think it's probably an older one, I also have a GE GFCI that I posted on here a while back. Also, thanks for the info on NTM and that outlet fragment. If I had thought about it, the decoration on that fragment looks like the one on the clawfoot combo I just found. I'm not sure how the clawfoot was supposed to be grounded. There's two terminals on each side of the device that have the word "connected" near them. On one side there is a space in between the terminals, covered with a piece of fiberboard that has "GR" printed next to it, but there's no terminal there. 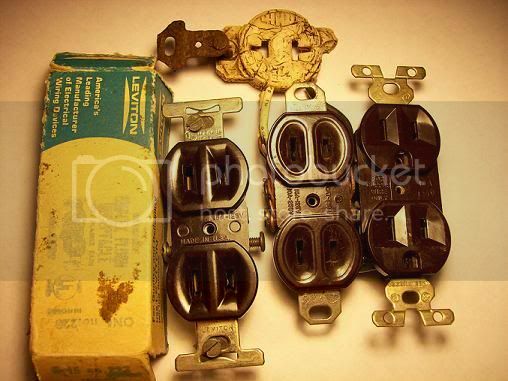 The metal strap also has "Grounded" printed on it, so maybe it was supposed to be grounded to the outlet box.